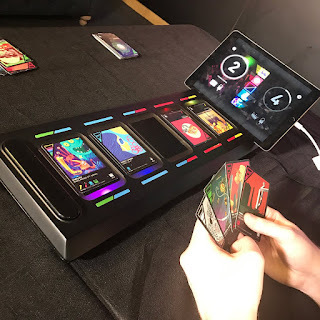 That's the play board for DropMix (WARNING: if you click on the link, the website has a little background video that implies you will be considered more sexually attractive if you play DropMix. This is almost certainly not true). Does this look, at first glance, like the kind of game I'd play? No. Then why am I playing it? It's a Harmonix game, and some of my favorite people made it. And, for discussion purposes, it's an interesting look at how difficult it can be for a great idea to get the attention it deserves. Here's the basic premise. The board is a mix deck, and each card has an instrument line from a song. So, for example, a blue card is a percussion card, and if you put it into one of the marked blue slots, you'll hear the percussion line from that card. Yellow cards are for vocals, etc. There are wild cards, too, and you can change the BPM of the mix and the key, if you want. From these different instruments and options, you put together a song. You dock your phone/tablet on the board, and there's an app that goes with it. Sometimes simple is brilliant, and it's certainly true in this case. In five minutes, at most, you understand how everything works. And the way that the game somehow combines tracks is nothing short of stunning. It's incredible how good everything sounds. I can't overstate the smoothness of the experience. You can save your mixes, of course, and I've even saved a few. I find it incredibly relaxing to play--relaxing and focused at the same time. Eli 16.5 loves it, too, and it's fun to alternate control and see what kind of mixes we come up with. There are other game modes besides freestyle, but we haven't even tried them. Seemingly, this has the makings of a big hit. So why isn't it? For that answer, I think we have to look squarely at Hasbro, the publisher. How much advertising have you seen for DropMix? I've seen zero. And this is a product that needs advertising--it's unique, and it needs to be seen. You can't just look at the box and understand the possibilities. Then there's the price. The game launched at $100, which is utterly ludicrous, particularly when there's an additional revenue stream in the form of expansion card packs. Second mistake. So you have a $100 game with no advertising. I walked into a Gamestop last week and asked the counter person if they had any DropMix cards. He said, "What's DropMix?" Third mistake. Now you have a $100 game with no advertising and low awareness by the very people who are supposed to be selling it. I did find a nice DropMix display at Toys"R"Us, but everywhere else, the product is hidden on back wall facing end caps or something similar. Fourth mistake. A $100 game with no advertising, no sales awareness, and ultra low visibility. Oh, and those expansion packs? It's not even easy to find all of them. The electronica pack ("Astro", I think it's called) is almost impossible to find. Fifth mistake. A $100 game with no advertising, no sales awareness, ultra low visibility, and poor availability of expansion packs. Had enough? What a colossal failure by Hasbro. And, thanks to them, the product sold so poorly that it was briefly available for only $50 a few weeks ago, which is when I picked it up. At least that temporary price drop was possibly an acknowledgement of how badly they screwed up the launch. At $50, this is an automatic buy. I can't say that at $100, but it's a unique, engaging experience, and it's definitely special. I'll let you know if I see it on sale anywhere.